Lincolnwood, IL: Passport Books, 1983. Text/BRAND NEW. Illustrated soft cover/NF w/smal crease to leading front edge. 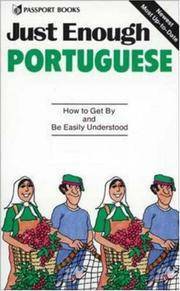 Conveniet, compact guide to useful phrases when traveling in Portugese-speaking regions.. Reprint. Soft Cover. Near Fine/None as Issued. London, UK: Penguin UK, 1972. Text/BRAND NEW, showing faint margin discoloration. Illustrated soft cover/VG; Strong & sound w/trace soiling, and light edge wear with two vertical creasings to front echoing on fEP. Trim and handy in size, a self-study language manual for travellers visiting Holland and Belgium. Strong copy w/worn. First Edition, Reprint of 1973. Paperback. Very Good/None As Issued.